Our Company - Mid Valley Tarp Service - Modesto, CA - Tarps, Roll Tarps, Curtains, Cargo Control, Graphics, Chains, Ropes, Ratchets, Netting, Vinyl, & More! Welcome to Mid Valley Tarp Services! All your tarp & cargo needs in one location! Modesto Tent and Awning, Inc. has been in business since 1930 and the division of Mid Valley Tarp has been a leader in the trucking industry for over 34 years. From customer service, to fabrication and installation, Mid Valley Tarp takes pride in delivering a quality product every time. Our experienced technicians pay attention to every detail to ensure we deliver only the best the industry has to offer. 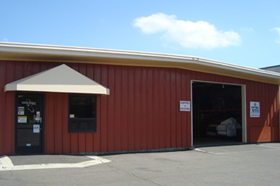 Mid Valley Tarp Service was established as a division of Modesto Tent and Awning, Inc. in Modesto, CA since 1985. These are our speciality. They are the most common item we fabricate and install. Another popular product in the trucking industry. Let us put your company logo on them! From the company logo to the CA numbers, we can make sure you are legal and noticeable. We carry all different sizes and colors. We have the one that fits your load. Guaranteed! Most of our ropes are CHP approved. We carry all types, color and sizes to fit your needs. We stock different chains and hooks to keep that cargo secure. We've got what you need.